This high performance ballast will maximize your energy savings. 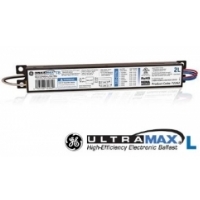 UltraMax ballasts represent a new breed of ballasts to make lighting systems that save energy, are more adaptable, and deliver optimal lamp performance. All UltraMax ballasts exceed the NEMA Premium® minimum efficiency requirements. Systems combining UltraMax electronic ballasts and T8 energy saving lamps deliver over 40% energy savings over standard T12 systems. Since energy costs are typically 80% of the overall cost of light, a more efficient system pays for itself in a short time and provide an excellent return on investment. Multi-voltage technology means the ballast can detect the incoming voltage and automatically adapt to any voltage from 108V to 305V, simplifying installation and compensating for voltage fluctuations. The high efficiency design will also result in cooler operation, providing additional energy savings. And, with a low lamp current crest factor (LCCF) of 1.4, UltraMax® ensures optimal lamp operation and maximum lamp life, which can save on lamp and maintenance costs. This model can drive either 2 or 3 lamps of the following types: F15T8, F17T8, F25T8, F25T12, F28T8, F32T8, F32T8/25W, F32T8/WM.